Bedding Style, online at BeddingStyle.com, is the ultimate source for your bed and bath needs. Bedding Style offers a huge selection of bedroom supplies as well as bathroom supplies. Among the supplies offered for the bedroom are comforters, duvet covers, bed in a bag, coverlets, bedspreads and quilts, sheets, kids bedding, bedding ensemble, blankets and throws, flannel, and daybeds. Among the products offered for the bathroom are bath ensembles, shower curtians, towels, and beach towels and mats. Shop among the best brands including Tommy Hilfiger, Laura Ashley, Steve Madden, Tommy Bahama, Michael Kors, City Scene, Columbia, L'erba, Vera Wang, and Perry Ellis. So checkout all the bedding and bath supplies at Bedding Style. Remember to stop by RetailSteal to find the best BeddingStyle coupon codes, BeddingStyle promotions, and Bedding Style discounts. Orders of $150 or more include free shipping. Available shipping methods are UPS Ground which takes 5-7 business days.Shipping is available only for the continental US. See website for full details, exclusions may apply. Spend $99 or more at Bedding Style to get free shipping. Click to shop. Take 20% off any order with no minimum purchase required using the coupon code when shopping online at BeddingStyle.com. Click to save. Use this coupon code on Bedding Style to save 10% on your order. Shop the clearance section online at BeddingStyle.com and enjoy up to 80% off a wide selection of bedding options. Click link to check out the range of Tommy Hilfiger bedding at Bedding Style, now up to 60% off. Take 58% off Michael Kors bedding when shopping online at BeddingStyle.com. Click to save. 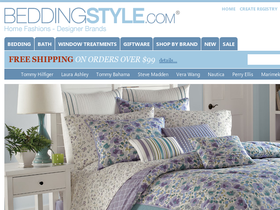 Save $20 on your entire order from Bedding Style when you use this coupon code online. Use code on orders of $100+ to qualify.